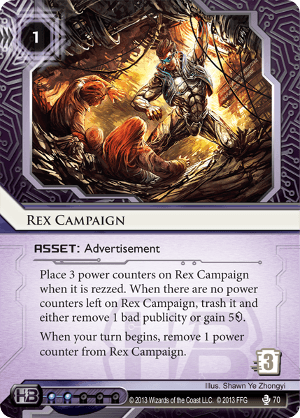 Place 3 power counters on Rex Campaign when it is rezzed. When there are no power counters left on Rex Campaign, trash it and either remove 1 bad publicity or gain 5credit. So until recently I never gave Rex Campaign much of a chance. Why include this blatantly inferior robot when you can have the sexbots? That was true until recently. This card isn't for HB, it's for NBN. Specifically Spark. Rex has all sorts of things that Spark wants. It's an advertisement. Low rez cost makes rezzing aggressively to proc Spark's ability viable, which isn't true of Adonis or Eve. Its trash cost is decent, especially when you consider Spark tax. You don't even want to bother protecting it because if the runner trashes it you're ahead, meaning you can put your ICE on things that matter. There are two downsides with Rex in Spark. Influence is a concern, but two is not horrible to deal with. The real issue is that it takes longer than other advertisements to give a return on your investment. 3 turns on the board is not short. In summary, you have to be willing to play a card that says "the runner loses a click and 4 credits" just as often as it says "delayed hedge fund/make Valencia sad". I personally am because I'm a terrible person, but your mileage may vary. Rex Campaign is a weaker Restructure on practically all matchups, since it gives a similar credit gain and must be protected to prevent it from being trashed. But a weaker Restructure is a small price to pay to get rid of Valencia's Blackmails, which can single-handely destroy any deck focused on big remotes and that makes it worthy of inclusion in Glacier decks in the post Order and Control metagame. Even considering the fact that Rex Campaign can attract a Blackmail itself, three copies of it plus GNRLD Refineries and the natural protection of Ash 2X are probably more than enough to get rid of the threat. And when it comes down to it, having to protect it is not much different than not being able to play PAD Campaign against Security Testing decks so it's not a huge issue. It's a nerf, but a tolerable one.